3 months ago, I wrote that the Argus II artificial retina implant had been recommended for FDA approval. 3 days ago, the FDA actually approved the device. 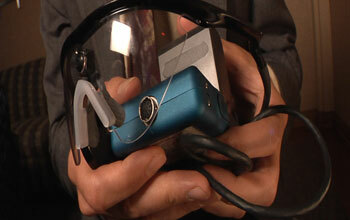 This is exciting news because the Second Sight device is the first bionic eye approved for patients in the US. The Argus II is the first treatment in existence that can replace the function of lost photoreceptors (light sensing cells) in the eye. The device transmits images from a small, eye-glass-mounted camera to a microelectrode array implanted on a patient’s damaged retina. The patient gets about 20 degrees of visual field. The FDA approved the device for people who have lost sight from retinitis pigmentosa (RP), which affects one in every 4,000 Americans. The implant allows RP patients who are completely blind to locate objects, detect movement and discern shapes such as large letters. Pretty amazing considering that these patients were completely blind prior to the surgery. The research team began their work in he 1980s and have received close to $200 million in funding from both governmental (NSF, NIH, DOE) and private sources to bring this device to market. The price of this device is speculated to be around $100,000. There is no word yet about insurance coverage. This entry was posted on February 17, 2013 by visionmd in Healthcare, The Eye and tagged argus II, artificial retina, artificial retina implant, blind, ophthalmology, photoreceptors, retina, Retinitis pigmentosa, RP.